During the Cold War years, the Soviets ran a secret, massive program that produced a million maps of cities and places around the world. They were remarkably accurate and contained information not found on local maps — like the “explosive devices” factory in Ballard. 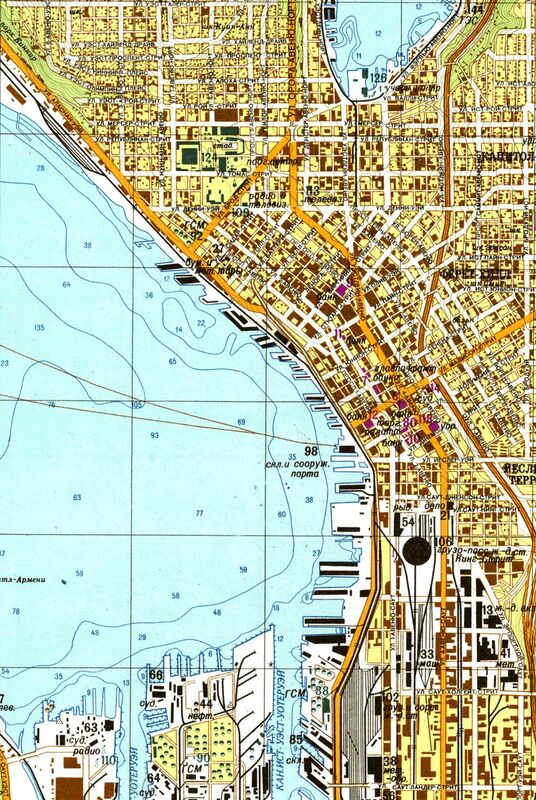 This 1976 map of Seattle is not the kind you would have bought at a gas station. Stories in the news recently are reminders of those days. We close their Russian Consulate in Seattle, citing the risk of spying. The Russians retaliate by booting out 60 American diplomats. This map was part of a massive Cold War effort by the Soviets. Over five decades — beginning with World War II until the Soviet Union collapsed in 1991 — it produced more than a million detailed maps of cities and places around the world. Thousands of hours of manpower would have been spent on the maps. “They must have been funded to a phenomenal degree,” Davies said in a phone interview from London. You could call the secret 1976 map “the Soviet of Seattle,” a not-so-joking reference to the “Soviet of Washington” title reflecting this state’s (meaning Seattle’s) lefty politics as distinguished from the rest of the United States. Besides the Seattle map extract, in the British researchers’ trove are ones of San Francisco, Los Angeles, New York, Paris, London and other cities. No. 29 is placed where 24th Avenue Northwest dead-ends at the bay, now the location of the Stimson Marina. What did the Soviets know? Tom Bayley, president of C.D. Stimson, has a guess. A May 4, 1983, Seattle Times story about Honeywell Marine Systems Division moving from Ballard to the Mukilteo area says the company is a prime contractor for the U.S. Navy’s lightweight torpedoes, working on homing systems. The work was important enough that the facility had “to maintain security,” the story says. Then there is the astonishing No. 26 on the Bellevue portion of the map, bounded by Bellevue Way Northeast to the west, Northeast Sixth Street to the north, 108th Avenue Northeast to the east, and Northeast Fourth Street to the south. 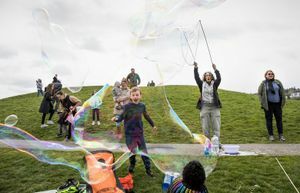 It’s abbreviated as “atom,” most likely an adjective, which, depending on the noun it went with, could stand for factory, lab or plant, explains Professor Galya Diment, a native Russian speaker with the University of Washington’s Slavic Languages & Literatures department. Davies says the Soviet mapmakers did make some mistakes — misnamed roads, putting in nonexisting subway sections. 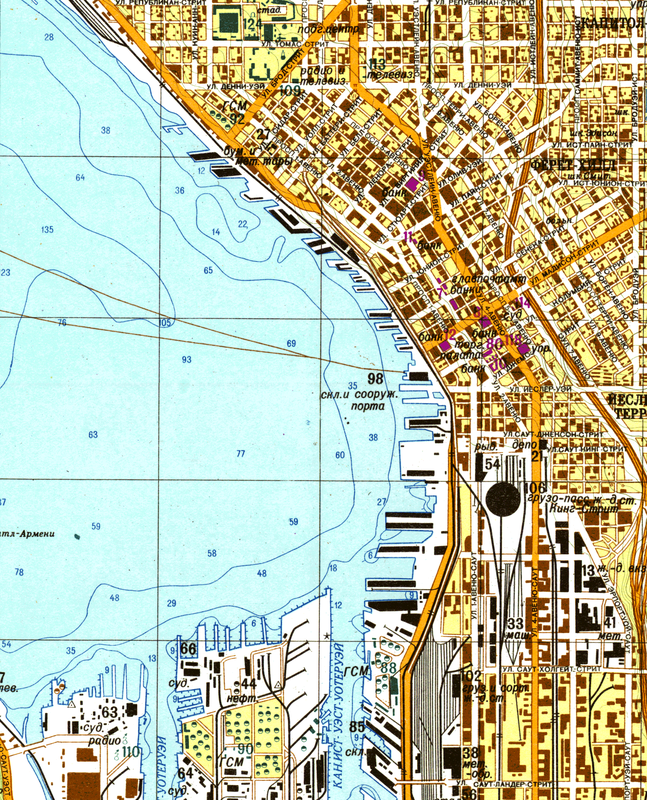 But he says they were also remarkably accurate, as was the case with pretty much everything on the Seattle map. Davies says he’s been contacted by individuals involved in military operations in Afghanistan. In some cases, the vastly more comprehensive Soviet maps were used by the U.S. in its 2001 invasion. 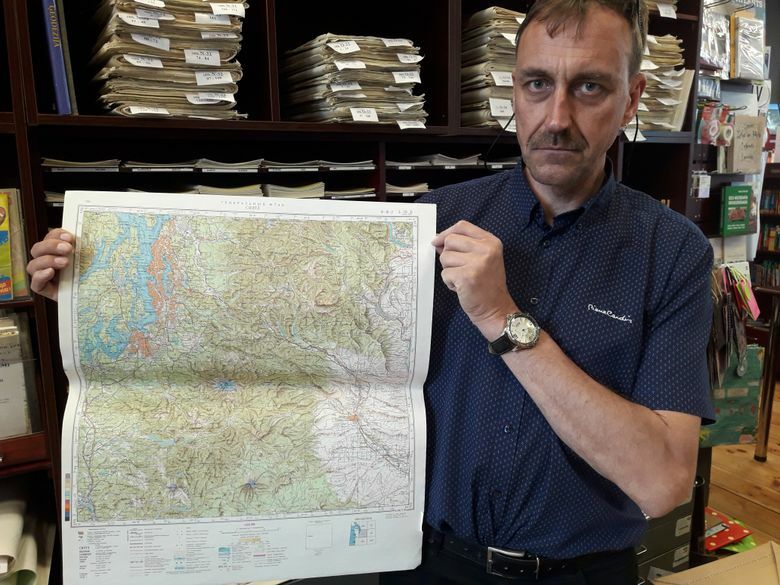 For the overall mapping project, Davies says, the Soviet researchers “must have acquired all kinds of documentation — street directories, trade documentation.” They used U.S. Geological Survey maps but then added their own information. 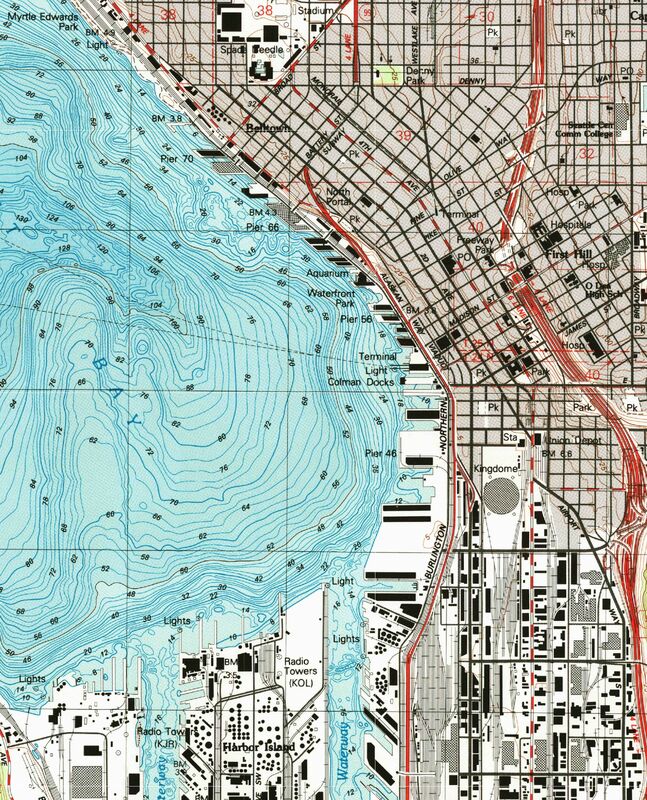 For Seattle, water depths for Elliott Bay were not shown on USGS mapping but they were on the Soviet map. Somehow, the Soviets determined the water depths — and they were also different from those on NOAA charts. 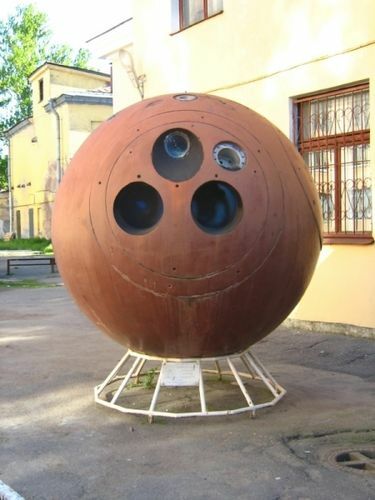 By 1962, the Soviets were using imagery from their Zenit spy satellites. The Soviet maps then could place new roads and housing developments that were yet to be included in local maps. The TV series “The Americans,” about KGB officers posing as an American married couple, raises the possibility that the Soviets had spies getting information for the maps. Yes, it happened, says Davies. The online publication Pravda Report quotes a retired Swedish secret-police chief as saying that Soviet agents would tour Sweden to check on such map items as the load capacity of bridges and the distance between trees. The Soviets arranged “picnics in the places of strategic interest, they would be very friendly and sociable to the local population,” says the story. Unfortunately for one Soviet spy, his conversation with a local about specific buried cables was overheard by a Swedish spy who happened to be on the beach, too, says the story. For Seattle, plenty was compiled, by whatever means. There were 134 “objects of interest” listed, including 52 “factories, industrial plants, commercial premises,” with their products or purpose. No. 123 was labeled “The Center for Space Exploration” in Kent. It’s Boeing 18-61 Building, used primarily for Department of Defense projects. The map doesn’t just list objects that would be construed as of military use. No. 9 is the “People’s National Bank of Washington” in downtown Seattle. No. 113 is “TV Station KTNT,” now KSTW. Then there is No. 79, offices for the Republican Party here. In Soviet parlance, it is “Department of the Central Committee of the Republican Party.” They don’t bother to list the offices for the local Democrats. Was the purpose for the maps to prepare for a military invasion? The maps “don’t have bombing targets,” says Davies. “In a nuclear war, what’s the point of mapping everything if you’re going to bomb it? The Soviets believed that capitalism would collapse, he says, and communism would be “the only world order.” The maps would help them manage that conversion. Maybe, says Jack Barsky, 68, who was born in East Germany and from 1978 to 1988 was an agent in the U.S. for the KGB. He now lives in the Atlanta area, has been a guest on numerous TV news shows and takes his story around the country. Barsky says he had never known about the secret maps, although he wishes the KGB had given him some. “My personal experience is that the KGB knew squat about Chicago in 1978 (where he first landed), or else they would have warned me of a place named the South Side,” he says. Davies and his writing partner found the maps by chance. Davies, a retired IT consultant, was working in Riga, Latvia, the former Soviet republic, in the early 2000s when he stopped by Jana Seta, a bookshop for maps. One of the men who had started the shop, Avers Zvirbulis, had earlier come across the secret maps. As the Soviet Union collapsed, a couple of Russian officers were told to destroy more than 6,000 tons of maps stored in Latvia. Zvirbulis negotiated to buy 100 tons of the maps, of which only two to three tons survived after kids vandalized and set fire to them, says Davies. That’s still a lot of maps, and “The Red Atlas” authors printed 350 extracts in a painstakingly designed book. The maps are in full color with Cyrillic wording and exquisite details — truly works of art. On the book’s website, Davies says the writers plan to sell prints of the maps soon. For Seattle, there are maps for the north, central and south end. “Of course, in a world of smartphones with GPS and driving apps with voices that tell us which roads to take, and which warn us where there is a traffic jam or a speed camera, paper maps may seem an anachronism,” says Davies.